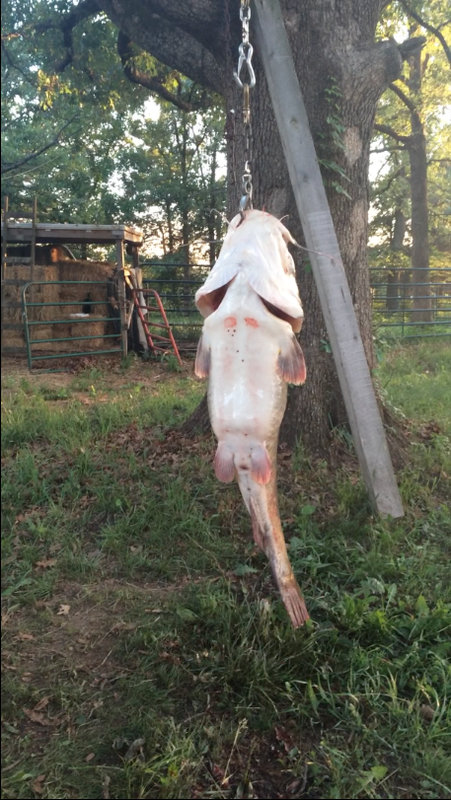 Ted and Joe Swoboda have been fishing for and preparing catfish for years, their knowledge and experience has lead to many successful days on the river and great fish frys. Everyone has there own techniques and opinions when it comes to fishing for catfish and in this video/instructional guide, we'll show you how to take that big catfish you caught and turn it into a tasty meal that everyone can enjoy. To begin, we suggest you place all of your caught fish in a large holding tank for 3 to 4 days in order for the dirty river water to get flushed out of the catfish, giving it a much nicer and cleaner taste. Make sure to remove the dirty water and add new clean water to the tank every day or every other day for a cleaner fish. Next, fashion a hanging chain or find a sturdy tree branch to hang your catfish from in order to be able to pull the skin off without having to hold it with two hands. It is very important that whatever you hang the fish from can withstand a fair amount of force, we highly suggest putting a chain around a large tree limb for the best results. Once the catfish is hanging from the tree take a long sharp knife and shove it through the brain of the fish, this is called stunning the fish and it will prevent any injury from the fish flopping as well as provide a humane way of filleting the fish. After the fish has been stunned take a sharp knife and cut a large slit above the tail fin to allow the blood to drain out onto the ground. This will make skinning and filleting the fish a much cleaner process. Allow for most of the blood to drain out before continuing with the next steps. 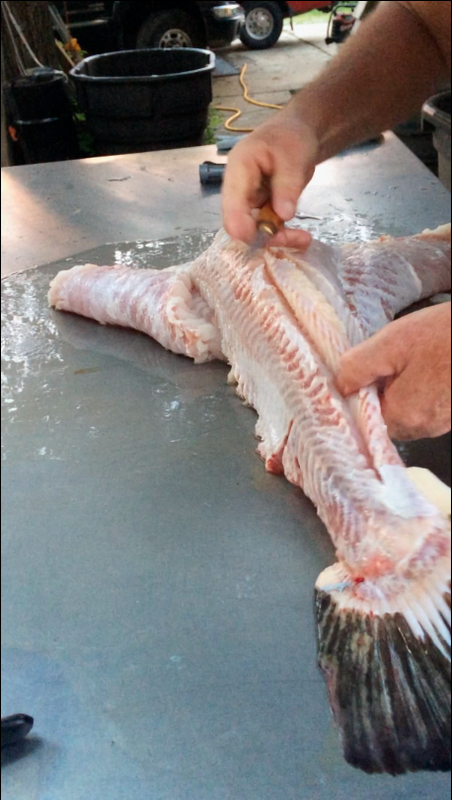 To prepare the fish for skinning make incisions on the back of the fish right below the base of the head. Make sure these incisions are deep enough to pull the skin off but not to deep. Make the cuts all the way around the fish cutting below the fins below the head and make cuts along both sides of the backbone of the fish. Be sure when cutting the fish NOT to pierce any organs, for this can lead to tainting the meat with the bile from the fish and will alter the flavor and cause you to have to clean the fish even more. Now that the fish has been cut for skinning take a pair of skinning pliers and starting at the top, grasp the skin of the catfish and pull in a downwards fashion being careful to grab the skin only and not the meat of the fish. The skin on the fish can often be very tough and hard to remove; this is why it is important to have the fish securely attached before pulling on the skin. Joe has found that the larger the fish the harder it can be to skin the fish. With enough patience and time you can skin your catfish as well. Often times alternating sides that you pull from on the skin can help work the skin off the fish. 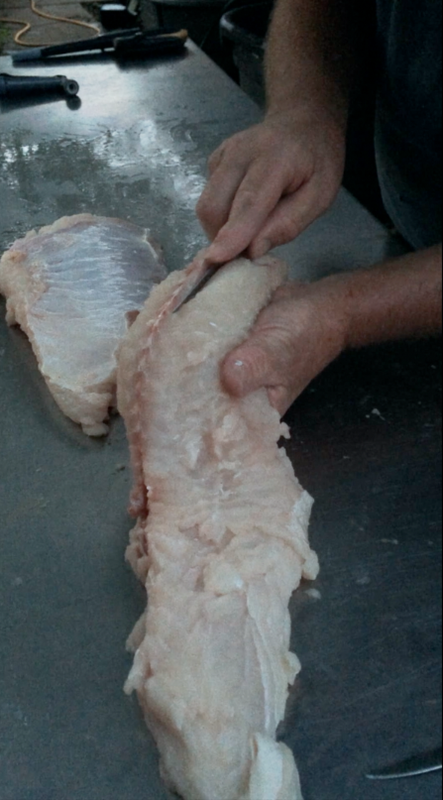 Pull the skin all the down past the tail until it is completely removed from the fish. Once the skin has been romped from the fish you will want to face its belly and slice it open all the way up the middle so that you can access the organs on the inside. Cut out the membrane that is holding the organs to the sides of the fish being careful not to pierce any of them. Once the organs are out of the way you can cut around the first fin and to the back of the fish to get more access to the fish. Loosen the organs from the spine all the way down the fish by cutting the bottom fins off and pulling the organs and bottom fins as one piece out of the fish. 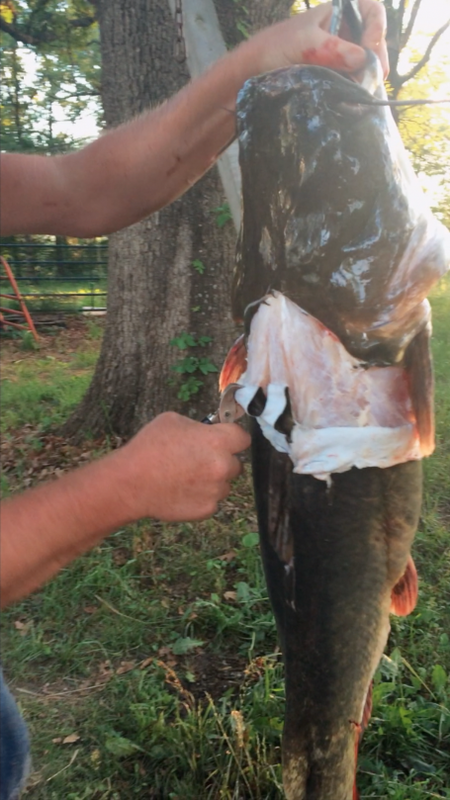 After the organs have been removed you can remove cut around the dorsal fin of the catfish so that it can be removed with the head when the time comes. This is a much easier technique that trying to pull the fin out later. To remove the head you can help yourself out by making a starter cut in between the vertebrae to assist you in ripping the head off of the fish. Once the starter cut is made grab the fish buy the tail with one hand and brace the head of the fish with the other, take the tail end of the fish and pull it up to the head until you hear a ripping and cracking sound and the head separates from the body of the catfish. Now that the head has been removed from the fish, all that should be remaining is the fillets with no organs. Take the fillets and wash them off in cold clean water so that any contamination can be removed and any excess blood will be washed away. If necessary you can change the water several times until the water no longer changes colors when you place the fish in it. Next, to begin filleting the fish start at the top of the fish and work your way down, cutting along the spine down the length of the fish. Make sure to leave the fat on the spine connected, this is not good eating and tastes very bad compared to fat you would find in pork or beef. Make sure to cut around the bones so that you don't include any in your meat. Now flip your fish over and finish cutting the fillets off making sure to cut off the meat from the backside of the rib cage to get the most meat out of the fish possible. Finally you can remove the red meat on the fish by cutting out the red strip on the fillets making sure to cut as close as possible to the strip of red meat to preserve as much of the white meat that you can. Once you have completed these steps you should have the fixings for a great catfish dinner! If you have any questions about the process involved in processing the catfish or if you just want to comment on part of our video, let us know in the comments below! Thanks and good luck! My Name is William Stokes and I am from the small town of Union, Missouri. My passion is everything outdoors and I love sharing my experiences with other travelers and wildlife enthusiasts. I love backpacking and enjoy the physical challenges that it brings me. I hope you enjoy my blogs and I would love to answer any comments left behind! Keep on keepin on from Wild Man Will!